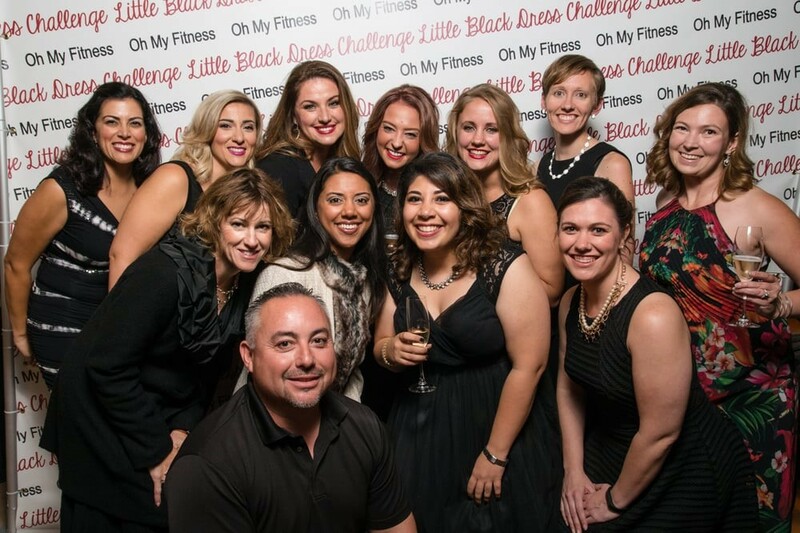 Photo backdrops transform consumers and event attendees into brand advocates in moments. Here are some backdrops that helped SpeedPro clients make a lasting impression and how they did it. 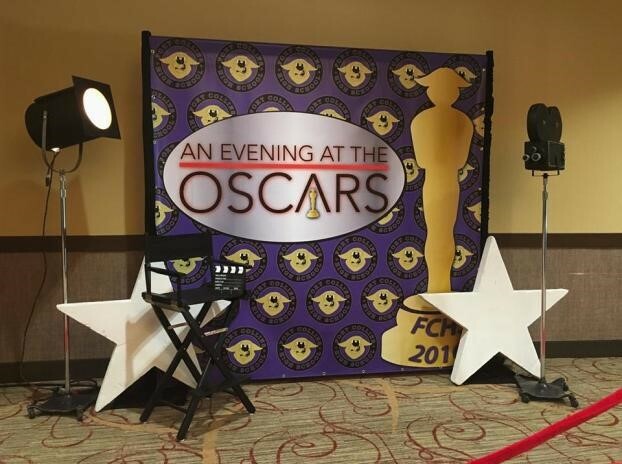 It’s hard to miss the big “An Evening at the Oscars” sign and tall, modified Oscars statue against the purple, black and gold background of this backdrop used by Fort Collins High School for a local event. This backdrop, with its fun theme, invites event attendees to have their picture taken in front of it. The director’s chair and big, white stars serve as enticing props. With the name of the school and image of the mascot behind them, students will leave the event with a keepsake photo that will help them remember their high school experience fondly. Businesses can use backdrops in the same way. Consumers can pose for photos in front of a branded backdrop tied to a fun theme and will associate the good memories of that event with the business. Athletic teams often use backdrops to announce the acquisition of a new player they’re excited about. It lets the community know “This is our superstar!” These backdrops include the name or logo of a team’s sponsor, which provides them free exposure and creates an association with the player in front of the backdrop. Backdrops are a great way to promote partnerships. 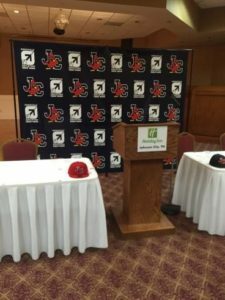 In a repeating pattern, both the Johnson City Cardinals logo and one of the team’s sponsors, Knoxville Employee Credit Union, stand out in this backdrop behind a podium. Ideally, this creates a symbiotic relationship – when people think the Johnson City Cardinals, a minor league baseball team in Tennessee, or their star player, they will also think of the credit union. Think of your backdrop as a versatile billboard. It’s large, branded and gets noticed. Using a backdrop at trade shows or conventions makes you stand out among your competitors or in a crowded convention space. It makes your company look more professional and attracts visitors to your area. Backdrops provide a great return on investment. Because the backdrop can be packed up and moved around, it can be set up at various events – charity functions, conferences, grand openings and more – providing your brand with more exposure to different people. And by virtue of the fact that attendees and media organizations are taking photos or videos in front of the backdrop, you’re able to gain greater brand exposure. At the same time, these photos may be shared through text message, email and social media platforms, further expanding awareness. Businesses and partner organizations should also share photos to their websites and social channels. As a result, hundreds to thousands more eyes will see the branding on the backdrop. Break Out the Props – If your backdrop is part of a gala, consider incorporating some props that will encourage people to have their pictures taken. People love to share fun or unique photos on social media. Avoid Glare – Backdrops are often made of vinyl, which can cause glare if not lit properly. Flashes from cameras will certainly create a glare. This will discourage people from sharing the photos. Go the extra mile to make sure your backdrop is staged correctly and consider hiring a professional photographer. Go in Together – If your budget is tight, ask the other brands or sponsors on the backdrop if they want to share the cost. After all, the backdrop is benefitting them as much as it’s benefitting you. Set Up Where the People Are – Set up your backdrop near the entrance where everyone entering the space will see it. If that’s not possible, set up in another high traffic area. Also, since backdrops are typically large, make sure they are secured to the floor and won’t fall over. To learn more about how SpeedPro Imaging can improve your bottom line with the right large-scale visuals and signage, check out our products and services.